These troops are members of Leibstandarte SS “Adolf Hitler”, at this time the regiment acted as Hitler’s personal bodyguard and guard of honor in public ceremonies. Later it would grow to form the Elite 1st SS Division LAH. They were assigned with the task of being Hitler’s personal bodyguards, a massive legion of SS soldiers would follow the Fuhrer wherever he went. They were also deployed in combat and were one of the most competent units in the war. 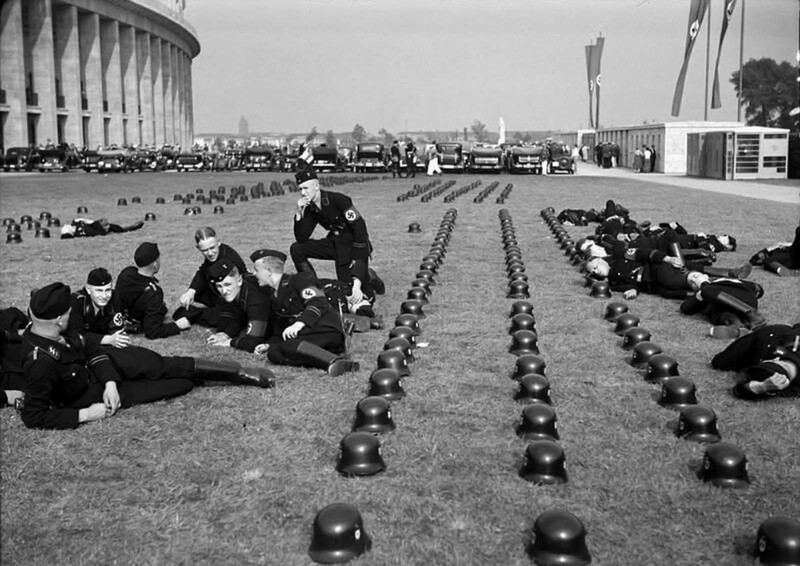 In the beginning, as the party’s military arm, the SS recruited staunch Nazis and supporters and made sure to drill them properly as well as equip them with the best equipment. They were the poster boys for the Aryan race after all. After the war started and casualties mounted the drill was focused on a few elite units as best as possible since it was increasingly difficult to maintain standards in times of lacking equipment and manpower. But those earlier units remained formidable enemies. Well drilled, equipped and fanatic. The LAH, because it bared Hitler’s name was always the first to receive the best recruits, best sergeants, the best and newer equipment, so it remained an elite unit right up to the end, even if almost depleted of actual soldiers. While a multitude of uniforms existed for the SS, often depending on the theater of war where they were stationed, the all black SS uniform is the most well-known. Black was seen as sombre and authoritative. The black-white-red color scheme was characteristic of the German Empire, and was later adopted by the Nazi Party. Further, black was popular with fascist movements: a black uniform was introduced by the blackshirts in Italy before the creation of the SS. There was a traditional reason, as well. Just as the Prussian kings’ and emperors’ life-guard cavalry (Leibhusaren) had worn black uniforms with skull-and-crossbones badges, so would the Führer’s bodyguard unit. As with many more formal military uniforms, these SS uniforms were tailored to project authority, and foster fear and respect. As Himmler put it, “I know there are many people who fall ill when they see this black uniform; we understand that and don’t expect that we will be loved by many people”. We always see these men in parade, straight, serious face, still, or marching. But this photo is certainly something new! I know exactly what those guys are thinking, I've been on parade and I know what it's like waiting before them on an early morning or after. What's for lunch, how long will this be, etc.